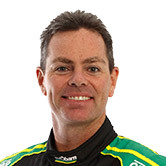 Craig Lowndes has taken his first Supercars victory in nearly two years, recording the 106th win of his career in the second leg of the Tyrepower Tasmania SuperSprint. Capitalising on his first ARMOR ALL Pole Award since August 2015 achieved earlier on Sunday, Lowndes led the bulk of the 84-lap race at Symmons Plains. He crossed the line 2.3571 seconds ahead of Scott McLaughlin, while Jamie Whincup completed the podium and becomes the new championship leader after throttle problems left Shane van Gisbergen 25th. Lowndes withstood an early challenge from van Gisbergen and started to edge away, leading by nearly two seconds when the 2016 champion pitted at the end of lap 14. The polesitter continued until the end of lap 22, building his advantage over Whincup to 2.6s before making his first stop. 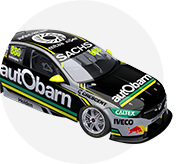 The Autobarn Lowndes Racing Commodore rejoined behind new effective leader McLaughlin, whose shorter fill already had him ahead of van Gisbergen. As the first round of stops were wrapping up on lap 29, Lowndes made a clean move down the inside of McLaughlin’s Shell V-Power Racing Falcon at Turn 4 to reclaim top spot. McLaughlin pitted first the second time around, on lap 47, his deficit to Lowndes having edged out to nearly two seconds. That left Lowndes sitting roughly five seconds clear of Whincup when they both pitted two laps later, the latter requiring the least fuel of the top three. Lowndes had just enough buffer to stay ahead of Whincup as the Red Bull Holden left its pit bay, and McLaughlin’s undercut put the Falcon at the Turn 2 entry as both Holdens emerged from the lane. McLaughlin slotted in between Lowndes and Whincup, with the trio covered by one second as they started to weave through lapped traffic early in the final stint. Lowndes crept away in the lead again, including as drops of rain fell briefly inside the last 20 laps, while Whincup closed in on McLaughlin. There was ultimately no change in the top three, Lowndes taking his first win since the second race at Queensland Raceway in July 2016. “It’s no secret last year was up and down and we’ve wanted to be more consistent. “I said from the start that this car suits me and hopefully we’ve proven this weekend. “It’s a first one for Irish (engineer John McGregor). He’s copped quite a bit of criticism but I think we’ve shown we can bounce back. McLaughlin split the Triple Eight ZBs, sporting tape on his left hand as a result of the gearbox shift-cut problems that slowed him on Saturday. "Congrats to Craig, it’s great to see him win," McLaughlin said. "We’re trying our hardest to fly the flag for the Ford fans and a podium today is like a win for us." While he had to settle for third, Whincup takes the championship lead, leaving Tasmania with an 11-point advantage over McLaughlin. Van Gisbergen slides to fifth, 40 adrift and one spot ahead of Lowndes. “Today was all about Lowndesy, what an effort,” Whincup said. “We tripped over him a little bit in the pits and it got a bit hairy with Scotty through Turn 3 on cold tyres, but we kept it all clean. “I was miles back [in points after Adelaide] and now I’m not, but there’s still a lot of water to go under the bridge. Van Gisbergen’s race unravelled in the second stint, when a throttle run-on problem became apparent. He fell from fourth to 12th, including going off at Turn 4 three times, as Red Bull HRT and van Gisbergen discussed bringing the ZB in for repairs or even to retire. The erstwhile points leader stayed out, but had fallen to last by the time he made his second stop, when a brake-bias bar that had moved was identified as the culprit, and crossed the line the last of the runners. Walkinshaw Andretti United continued its resurgent start to 2018 with James Courtney finished fourth and Scott Pye sixth, both drivers making spots from seventh and 10th on the grid. Pye closed on Tekno Autosports’ Jack Le Brocq in the closing laps, as the rookie battled front-splitter vibration down the back straight. In the end, Le Brocq capped a breakout weekend with fifth, having started and finished in the top 10 for the first time on Saturday. Coulthard was running in sixth at the halfway mark of the race, when his Shell Ford shed its left-rear wheel nut exiting Turn 3. He limped back to pitlane and lost a lap on his way to 17th place. The Holdens of Garth Tander, David Reynolds and Nick Percat and the best of the Tickford Falcons of Chaz Mostert rounded out the top 10. Tickford had endured a tough weekend leading into the race, with Mostert declaring earlier on Sunday that something felt broken in his Falcon. It appeared to come to life in the first half of the race, rising from 11th to fifth during the second stint. But after being passed by Le Brocq on lap 35 down the back straight, he overshot Turn 4 the next time around, losing another spot to Coulthard. Mostert was back in 10th after the second round of pitstops, while Mark Winterbottom and Cameron Waters were 12th and 13th. Breaking that chain of Falcons was Rick Kelly, the lead Nissan on a day Michael Caruso finished 24th, having served a 15-second penalty for turning Will Davison around at Turn 4 on lap 3. Tickford Racing rookie Richie Stanaway’s torrid season continued, retiring on the opening lap with significant left-rear corner damage sustained as the pack tackled Turn 4 for the first time.